Dr. S.V. Sreenivasan is the Joe C. Walter Endowed Chair in Engineering, a Professor of Mechanical Engineering, and a Professor of Electrical & Computer Engineering at The University of Texas at Austin. He is a nanotechnologist with an interest in creating high throughput nanofabrication techniques that enable applications in mobile electronics, advanced displays, healthcare and energy sectors. He has published over 130 technical articles and holds over 100 U.S. patents in the area of nanoscale manufacturing. Dr. Sreenivasan is co-director of the NASCENT Center(link is external), a National Science Foundation funded Nanosystems Engineering Research Center. NASCENT Center is an interdisciplinary research effort in the area of high throughput nanomanufacturing systems that enable future generations of mobile computing and mobile energy technologies. Dr. Sreenivasan co-founded Molecular Imprints Inc. (MII), a nanopatterning spin out from UT-Austin. He currently serves as the Chief Technologist of Canon Nanotechnologies, Inc., a company formed as a result of the acquisition of the semiconductor business of MII by Canon Corporation in 2014. MII is continuing to commercialize nanopatterning in other areas such as displays and data storage. 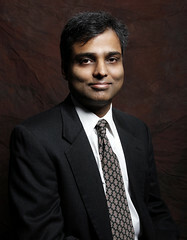 Dr. Sreenivasan has received several awards for his work including Technology Pioneer Award by the World Economic Forum (2005), University of Texas Chancellors' Award for Entrepreneurship (2007), The ASME Leonardo da Vinci Award (2009), The TAMEST O'Donnell Award for Technology Innovation (2010), the ASME William T. Ennor Manufacturing Technology Award (2011), the UT-Austin Inventor of the Year Award (2012), and the ASME Machine Design Award (2017). He was named fellow of the National Academy of Inventors in April 2017.